Security Today is more than Just Locking – today, the standard set for modern IT–Infrastructure requires the highest level of physical security and has driven the development forward from a purely mechanical handle to a mechatronic handle system. This is something which our Electronics Business unit understands very well, which is why we developed our Biometric access control system to ensure that access control does not end at the entrance door to the data centre! 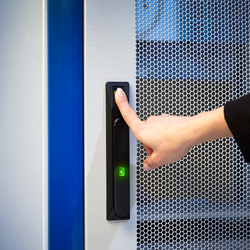 Biometric access control, combined with our proven and tested electromechanical swing handles, results in significantly increased access security in data centres. Our Electronics Business unit offers a full spread of Electronic Locks for All Installation Situations including the Agent E: Wireless Handle with Memory Function. This program provides 100% access control and 100% monitoring for compact and easily expandable Rack Management using a Modular IT Infrastructure and ELM DataBase Software for Central Multi System Management. Click HERE to read Whitepapers on this subject. Share the post "Security Today is more than Just Locking"